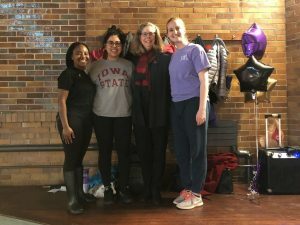 Iowa State’s chapters of National Society of Black Engineers, the Society of Hispanic Professional Engineers-Latinos in Science and Engineering (MAES) and the Society of Women Engineers worked together cofound the “Engineering the Way” a 4K fundraising walk/run held on April 14. Iowa State President Wendy Wintersteen gave remarks at the beginning of the event, commending NSBE, SHPE-MAES and SWE on their collaborative efforts. “Engineering the Way” charged $15 per person with all proceeds going toward the 50K Coalition. The event was set to occur on central campus but was moved to State Gym due to weather conditions. “I feel like the event went well. We didn’t have as much participation as we could have, but the snowy, rainy weather was a big factor in that,” Peters said. When Tiara Turner, president of ISU NSBE and senior in industrial engineering, heard about the 50K Coalition, she thought right away that a group-hosted event would be beneficial to the common goal. NSBE, SHPE-MAES and SWE are three of the four founding national organizations of the 50K Coalition. About 20 other organizations have since joined the mission, seven of which hold chapters at Iowa State, according to Peters. NSBE, SHPE-MAES and SWE are now putting together a group to discuss steps to make Iowa State a nationally recognized part of the 50K Coalition, which could bring unity to the organizations and attract more attention from students and corporations to Iowa State, according to Turner. All three of these organizations also hold goals in professional development and community outreach, which coincide with the mission of the 50K Coalition. SHPE-MAES is a hybrid of two organizations, the Society of Hispanic Professional Engineers and Latinos in Science and Engineering and abides by both of their organizations’ missions. Considering the commonalities in the missions of each organization, the groups collaborated toward their common goal of expanding the diversity of graduating engineering students. Other outreach efforts conducted by the organizations include STEM camps, SHPE-MAES’s ISU for You Promise, Noche de Ciencias (Science Night) and Mayas Extravaganza, SWE University and NSBE’s Walk for Education and Engineering the Future. “You want to plant the seed in younger generations. The work that the 50K Coalition is doing at the middle school and elementary level is going to be really integral and touches back on the community impact of our mission,” Turner said. Click for more information about the 50K Coalition, the National Society of Black Engineers, the Society of Hispanic Professional Engineers, Latinos in Science and Engineering or the Society of Women Engineers.